Jacob’s teaching and research interest is located at the intersection between communications, peacebuilding, and conflicts in contemporary society, with particular reference to Nigeria (and the broader Lake Chad region), Somalia, and the Democratic Republic of Congo. Jacob is particularly interested in how communication interventions are localized, encountered and contested in violently divided societies. The applied area of his work involves developing and deploying contextually relevant strategic communication solutions to local and national crises and working with civil society and social movement organizations to achieve social and cultural change. Jacob is presently a Visiting International Scholar in International Studies at Dickinson College, Carlisle, Pennsylvania, USA. 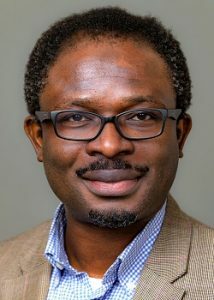 Until his visit to Dickinson, he was Interim Dean of Arts & Science and Chair of the Communications & Multimedia Design Program at the American University of Nigeria and a Visiting Scholar at New York University’s Center on International Cooperation. He is the author of ‘Convincing Rebel Fighters to Disarm: UN Information Operations in the Democratic Republic of Congo’ (DeGruyter, 2017) and several other works.